These new models offer increased visibility to the loader arm and bucket as well as improved efficiency thanks to a redesigned cab. John Deere has announced that it is introducing two new models to its L-Series lineup: the 244L and 324L compact wheel loaders. These models are both ideal for landscape/snow removal, ag material handling, and construction tasks. 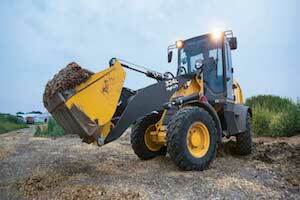 In addition, they offer operators more uptime, leading to increased productivity and efficiency on the job. "Our next generation of compact wheel loaders was designed to meet the needs of industry professionals who are demanding higher performance from their machines," said Drew Miller, product marketing manager, compact wheel loaders, John Deere Construction & Forestry. "Tailor-made for tight spaces, the 244L and 324L use our proprietary Articulation Plus system to provide greater stability and yield more lifting power while turning tighter." Both the 244L and 324L have an auto shift hydrostatic transmission, which is coupled with an automatic two-speed gearbox. This allows for faster traveler speeds up to 23 miles per hour – a 21 percent increase over K-Series models. In addition, each machine has a Final Tier 4 engine with 73 horsepower. To round out the features, the 244L and 324L have redesigned cabs. Operators can opt for an air ride, high-back operator seat that makes for a smooth ride. There is also increased visibility to the loader arm and bucket, and the interior layout of the switches and gauges ultimately improves overall efficiency. JDLink telematics provide real-time data on health prognostics for the utmost productivity. To learn more about the 244L, 324L or any of the compact wheel loaders John Deere has to offer, speak to your local John Deere dealer or visit www.JohnDeere.com.